Constructed by man, without power equipment, Grand Lake St. Marys served as a feeder lake for the Miami-Erie Canal. At its completion in 1845, it was the largest man-made lake in the world and is still the largest hand dug lake. Workers received 30 cents a day and a jigger of whiskey for their labors. In the early 1890’s the lake became the site of the first off-shore oil drilling platform. By 1915 there were more than 150 oil wells in the lake. Other past business ventures on the lake included ice harvesting and commercial fisheries. It was also the location of a large amusement park, dance halls and church camps. 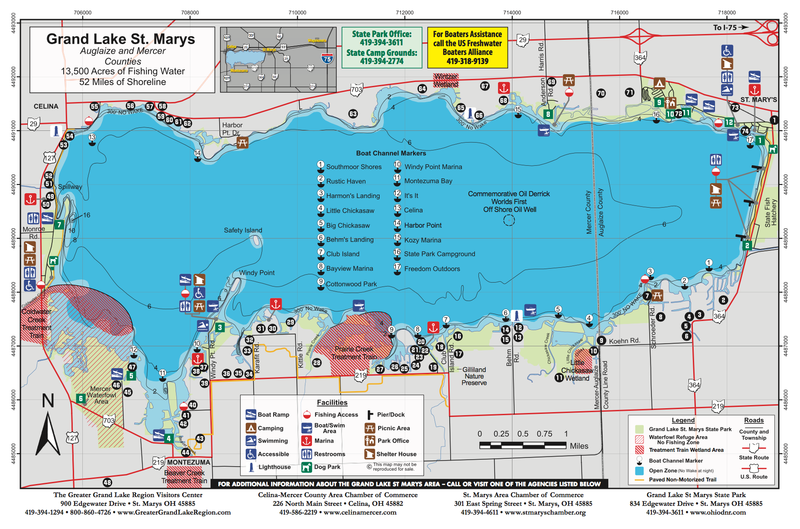 Today Grand Lake St. Marys State Park consists of nearly 600 acres of prime lakeside parkland. You will find trails and walkways, great access to fishing, swimming beaches, picnic amenities, excellent bird watching, public boat launch areas and a large, well maintained state campground. You’ll also find: Year round fishing, with many tournaments held on the lake each year • Sport fishing species include bass, crappie, perch, bluegill, catfish & walleye • Three pair of nesting American bald eagles • Over 10 miles of local nature hiking & biking trails • Excellent goose and duck hunting • A state fish hatchery • Snowmobiling • Waterfowl refuge and wetlands nature observation decks and trails • Handicap access fishing piers and boat docks Kayaking clubs • Ice Fishing • Four bait & tackle shops around the lake • Great for Bird Watching – with a wide variety of waterfowl and migratory birds. 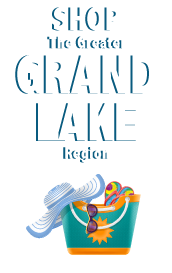 The 3 lighthouses on the lake • The many lakeside festivals, concerts, races and other fun events • The great local cuisine and lakeside dining available at a number of local restaurants. You’ll find 13,500 acres of water and 52 miles of shoreline • Four boater’s beaches •Unlimited horsepower • Boat rentals available • 35 boat launch ramps – including seven free public launch sites • 13 restaurants, clubs and bars with lake access offering a wide variety of food and beverages • Both Moose and Eagles Lodges with their own marinas and a large number of courtesy docks • Open skiing • Excellent sailing lake • Three full service marinas • Fun boating events such as the LIA Barstool Open and Boat Decorating Contest and the Lake Festival Boat Poker Run • St. Marys Boat Club and their weekly sailboat races •Watching fireworks and Lakeshore Park concerts and events are even more enjoyable from the deck of your boat. From primitive campsites to lakeside, Jacuzzi hotel suites to homey cottages, you will find a wide variety of lodging options for your visit including two hotels with lake views, two hotels with docks available for guests, over 1,600 camp sites along the lake and many cottages, cabins and overnight facilities.